Learning how to build a pet door can save you hours of time opening and closing the door for your pet. Luckily, with the variety of pet door kits available, this project should only require about an hour to complete. Before picking out the door you want, be sure your home is suitable for a pet door. Taking the time to consider the implications of installing a pet door will reduce the chance that your pet door will remain unused after it is installed. Make sure that your pet door will be able to function. Decorative storm doors, for example, will have to be removed or always opened when the pet door is in use. French doors and sliding glass doors are also unsuitable for a pet door. Check your fence and yard. Unsupervised dogs can jump over or dig under fences, eat poisonous plants, or dig up landscaping. Try to minimize temptations for your animal to misbehave. Be sure your pet will use the door. While some animals may be initially hesitant to use a pet door, yet quickly adapt, others may refuse to use a pet door. Be prepared for energy loss. Drafts are common in areas with a pet door and may cause a significant rise in your heating and cooling costs. Choosing the correct pet door for your pet and home is essential to the success of this project. The large variety of options available may cause you to overlook a key feature needed for your pet door. Be sure to choose a door that is suitably sized for your pet. An extra large door does not necessarily mean it will accommodate an extra large dog. Think about security. Make sure that the door can be securely locked at night or when you are on vacation. Consider wildlife. People that live in rural areas should be aware that raccoons and other animals may attempt to gain entry into your home through the pet door. A magnetic collar on your pet that works with the door can act as deterrent. In urban and suburban areas, homeowners may find that stray pets may wander into their homes. Try to prevent energy loss. Pick a pet door that will seal well with the exterior door to prevent drafts. After you've chosen the proper door for your pet, a kit purchased from any home improvement center ought to make this a quick job that even a beginner can complete in an hour. Using a level and measuring tape, draw an outline of the hole needed on the door in pencil. The manufacturer should provide dimensions for your door. Be sure to allow for at least three inches at the bottom before cutting your hole. In general, you should also try to center the hole as much as possible. Cut out the hole using a saber saw. Using silicone caulk, place a bead around both sides of the newly created opening. Press the frame of the pet door through the hole and into place. Go to the other side of the door and press the corresponding piece of trim until it locks into the pet door. Knowing how to build a pet door may tempt you into installing one under less than ideal circumstances. Remember, some pets are not suited for a pet door. It may not be reasonable to build a door for a particularly large pet. 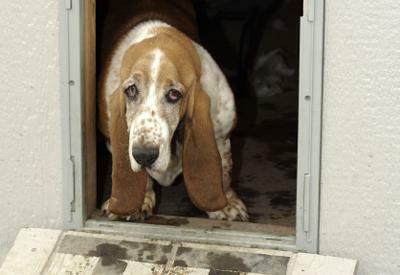 Other animals may balk at using the pet door, regardless of how they are introduced to it. For these reasons, consider carefully whether a pet door can work for you and your pet before you decide to install one.